March 1, 2014 July 11, 2015 Posted in Food, Snacks, Starters. Earlier I have not been a fan of mussels but now I have learn to like them a lot. Mussels (blåskjell på norsk) which you got from the shops in Bergen are quite fresh. Maybe that is the reason they are so good. Here is the wonderful recipe for mussels that are gratinated in the oven and served with soft bread. The original recipe is from here (only in Finnish). I modified it little so here is my version in English. Recipe is for four people as a starter. Wash the mussels and remove the beard. Be sure that the mussel is still alive by knocking the mussel which is open in the table. If it won’t close itself you should throw it away. Read more about how to clean mussels. Put butter to a pot and let it melt for a while. Add the chopped onion and garlic to the pot and warm them up on medium temperature. Add white wine and rise the temperature. When the wine is boiling throw the mussels to the pot and cover it with a lid. Let it be about two minutes and shake the pot a couple of times with lid on the top. Mussels will cook in hot steam. When most of the mussels are open they are ready. Lift them to another bowl. Now you should remove the other side of the shell. So remove the side that is not attached to mussel’s meat and throw the “clean” shell away. Place the shell (which have meat) to a baking tray covered with rough sea salt. Mussels will stay nicely at their place. Make the herb-garlic butter. Mix all the ingredients to soft butter. Now you can start filling the mussels with the butter. 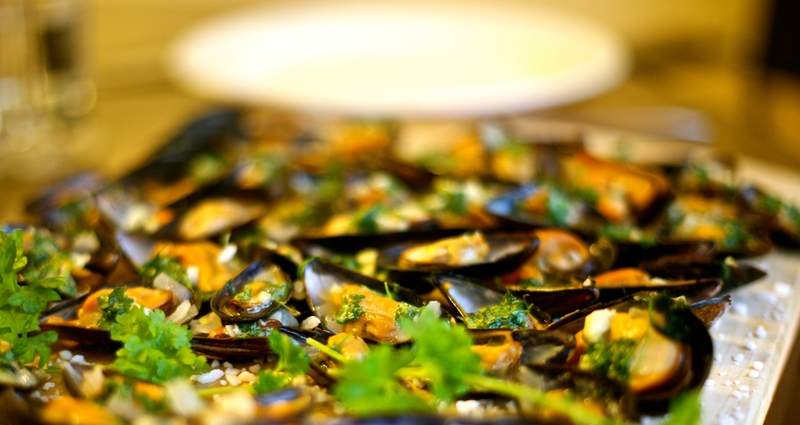 So fill all the mussels which have meat attached with herb-garlic butter. Then set them to the baking tray. Bake in the oven about 220 celsius about six minutes. Serve right away with white bread and white wine.